By now, you all must have had heard of Zurker. Some people are calling it a replacement of FB. Though the idea is very creative to make the user also a part of the hierarchy. Though only the time can tell how big is it gonna be or will it be a complete flop. Presently its still in beta phase and one can join it by referral only. Those who are interested can join it from the following referral URL. I used to be a fan of you. We have witnessed a no. of events of my life together through those Facebook updates. We shared a lot of history together which can be found under your history tab. You know a lot of my secrets. But it seems like the time has come to depart. Now you have started to become a problem in my life. When I want you, you takes a lot of time to serve my requests. When I leave you there for enough time to serve me later, you start giving me troubles in my other jobs (CPU usage problem when left idle for enough time). Though I hate to leave you but you leave me no option than to find another companion for the journey ahead. But I want you to understand that I am not leaving you for forever. I know you are the best and I will not be able to find someone else who would serve me like you but its better for me to stay away from you for sometime. Following is the code to clear the screen on terminal. Above program does nothing but writes an escape sequence on screen. Escape sequences are used to control the display properties like graphics,control cursor movements and key reassignment. Above one is specific to clear the screen. \33[H sends the cursor to home location and \33[2J clears the text on screen. It can also be used interchangeably i.e first clear the screen and then send the cursor to home location since printing of terminal info (like root@localhost] ) takes place after executing the complete process though if you write the separate programs for both escape sequences individually and then execute them sequencially, output may differ based on order of execution. You can use dconf-editor also to edit these settings. dconf-editor is not installed by default in your system. But as turning off the power settings is not a good solution, you can also try installing caffeine. sometimes adding this to .bashrc will not work. Try to add this command to “startup applications”. Was just browsing through the net from my FF12 in Ubuntu 12.04, right clicked on a web page and saw this new element in right click menu list “Inspect Item (Q)”. Just clicked on that and wow, its a can of “lovely worms”. Better source browsing with respect to the items on page, 3D view of the page to explain the layered structure of the page. I would say it makes a great learning experience for HTML/ Web Programming beginners to understand the different tags of HTML. 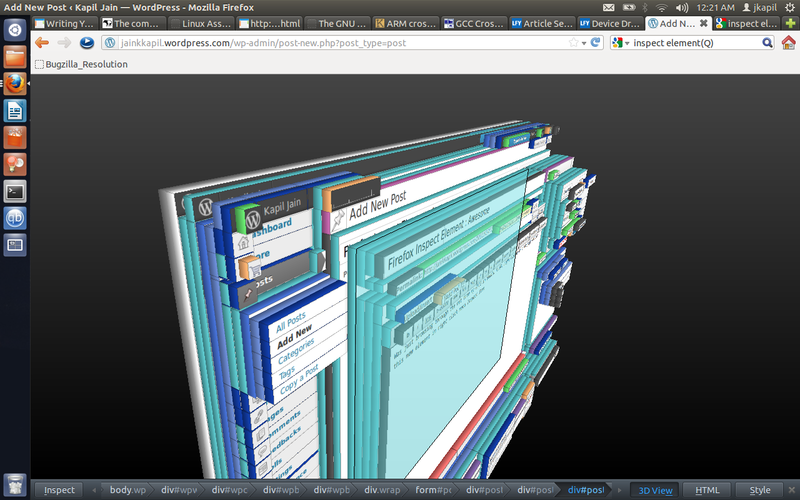 Also it makes easy to understand the layout of complex web pages. I would say its a great great feature mozilla have embedded into FF. Though I am a little ate for this as Mozilla embedded it in 10.x release of FF only but its never late to have learnt something new.